I just came back from a December trip to Paris and I’m more in love with the city than ever before! While I didn’t mind visiting the city in the winter, I do have to warn you, be prepared for the weather! 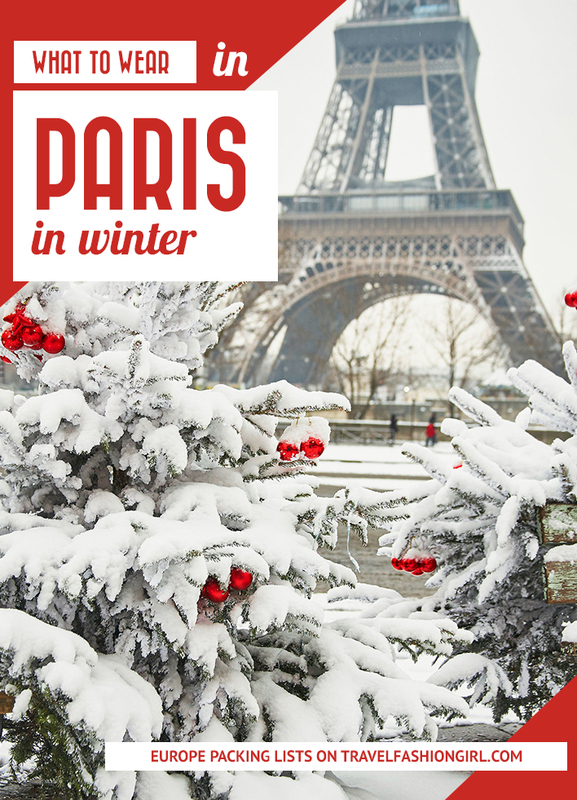 Read this post on what to wear in Paris in winter so you’ve got all the necessary essentials! How can I sum up Paris in winter? It was cold. It was rainy. It was windy. AND THEN IT WAS VERY COLD. And as the day went on and we were outdoors for an extended period of time, it got EVEN COLDER. 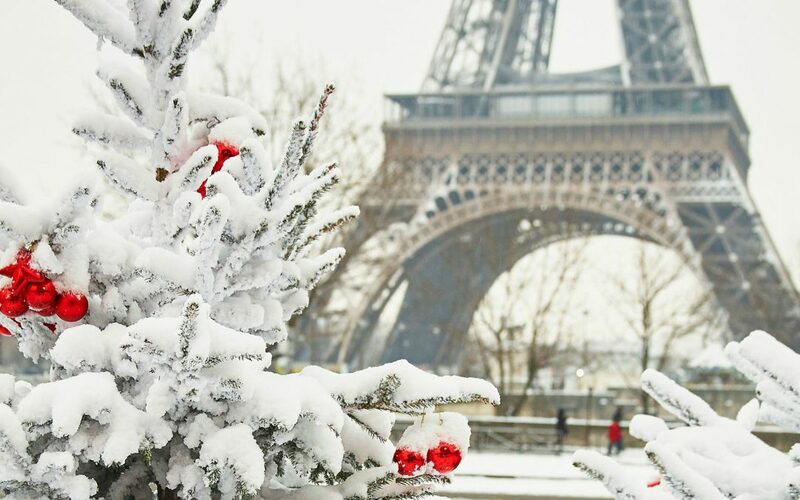 Generally speaking, winter in Paris runs from late November through March and has a reputation for being dark, wet, and gloomy. Although it doesn’t usually snow, you should keep track of the forecast so you can be prepared for different climates. Be aware that some sites may close if it does snow so plan other activities for your trip and bring appropriate clothing so you don’t freeze. Unlike winter at home, you have to be more prepared when you’re on the road because you’re not just going from point A to point B. You’ll be doing a lot of sightseeing and spending extended periods of time outdoors, which means you’ll feel colder than you would normally. You should always check the extended forecast when planning what to pack for a trip. You not only want to check the temperature but you also want to make note of the sun AND the wind chill factor. 5C / 41F in Paris felt much colder when there was high winds and rain. Likewise, it also felt slightly warmer during the daytime when the sun was out so leave room in your purse to store your layers throughout the day. Be prepared with the right clothing as explained below! 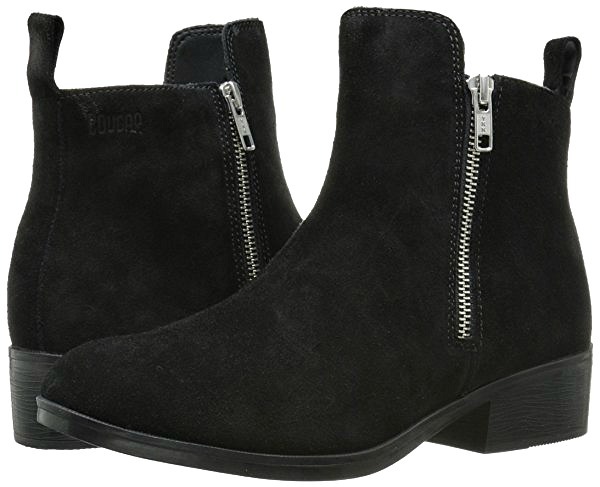 In terms of what to wear in Paris in winter, the locals generally went for black or camel color coats paired with black/grey/dark blue jeans and black ankle boots or leather sneakers. A warm blanket scarf was necessary to battle the cold and the color of choice was either a neutral grey/black/white pattern or pop of color. Dresses with opaque or sheer tights, black coat, neutral print scarf, and black ankle boots was also a popular ensemble. I came across an article online that said that Parisian women would never wear “cold weather accessories” such as a knit hat and gloves. Whether or not that’s true, you have to remember that locals go from point A to B and don’t spend as much time standing around outside whereas tourists are sightseeing or waiting in long lines. Consequently, using practical yet stylish clothes is better than trying to “blend in” and sacrificing your warmth. Unless you’re not planning on doing any outdoor sightseeing, then I’d recommend you make the “touristy” sacrifice of wearing these items. There’s nothing worse than feeling cold on a trip. Tip: Less is more! Choose one awesome accessory and keep the rest of your clothing neutral. The main thing to note is while the locals were wearing regular winter coats like these, they weren’t going to be standing around outside all day sightseeing so we’d still recommend you bring a nice waterproof coat instead. Because the lines for entry to popular destinations were slow and long, it was essential to be warm and have a waterproof jacket plus an umbrella. We stood in line outside for an hour to go into the Catacombs even with pre-purchased tickets. The lines at the Louvre and Notre Dame can also be just as long. I was so happy I had an awesome jacket and travel umbrella to keep me warm and dry especially as I stood in line for an hour in the rain for the Catacombs. That’s what I call a balance of function and fashion! 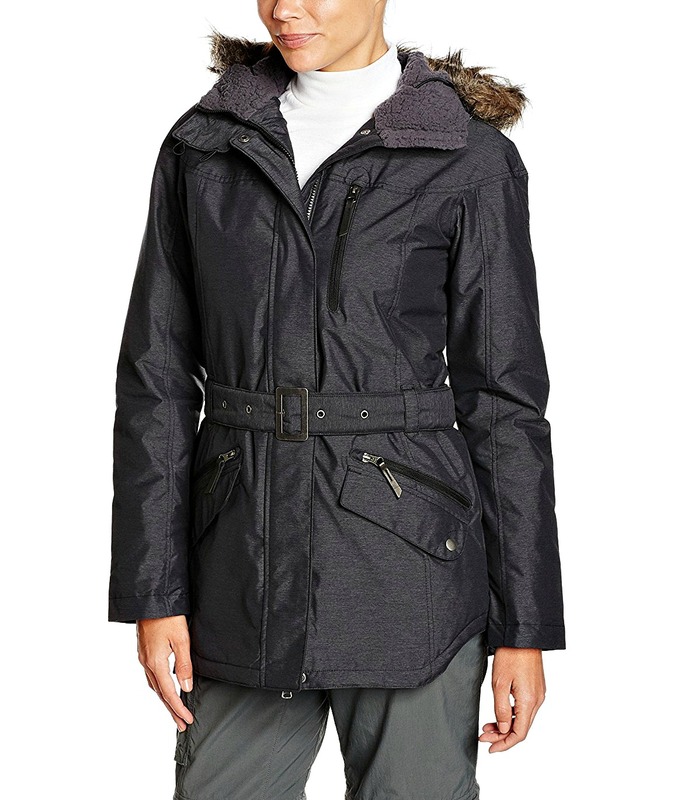 I used the Carson Columbia jacket (shown above) and have nothing but great things to say about the numerous features. The New Europe tour guide even asked me where I got it. She said it looked so warm. If you do opt for an outdoor brand as I did, avoid big visible logos for a more subtle look. I recommend keeping this tip in mind when deciding what to wear in Paris during winter. Keeping your hands, feet, and head warm help to keep the rest of your body warm, too. Make sure to bring warm socks, gloves, and a hat! Even if your clothing isn’t the warmest, these accessories will help keep you warm. Also, don’t forget to bring your a warm blanket scarf in a neutral print like this or a color to add a little interest to a solid travel wardrobe. Wear it around your neck or drape it over your shoulders like a poncho. Take a look at this inexpensive cashmere-feel scarf or this merino wool scarf. If you usually wear black pants or skirts, add a pop of color by throwing in a scarf or hat. Not only will this add extra warmth to your outfit, but it will make you feel instantly brighter and more stylish. As you plan what to wear in Paris in winter, remember that while it’s true that Parisians love wearing the color black, they don’t just stick to this one color. Instead, they wear two-three neutral colors like these. When it’s very cold, I layer merino wool and/or silk thermals underneath my clothing. 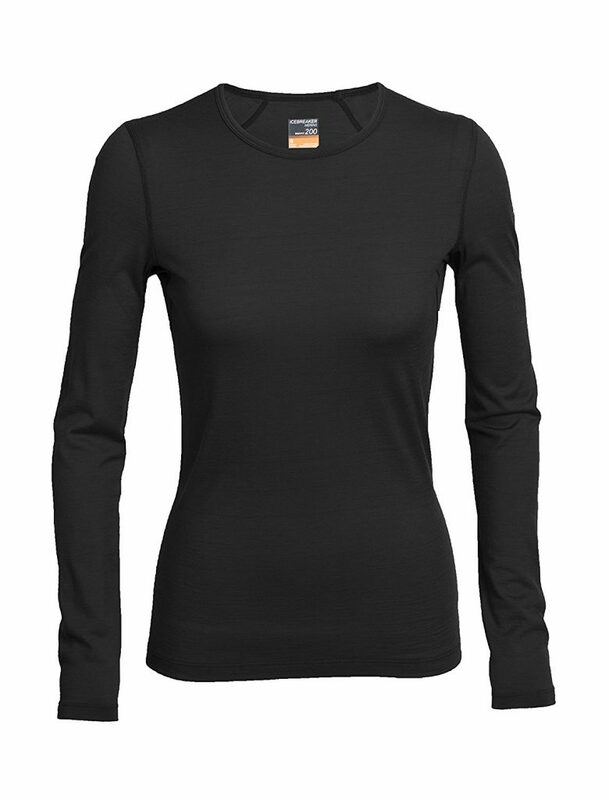 The best are made from merino wool and these are truly the absolute best fabric for thermals. If you’re only going to invest in one merino wool item make sure it’s thermals! While wearing jeans without an underlayer might be fine for home, it’s not the same when you’re traveling. It’s surprising how cold your legs can get when you’re standing outside in the rain and wind for hours at a time. I have both merino wool and silk thermal pants, and you can also use leggings or tights underneath your pants to stay warm in cold weather. At 5C / 40F in Paris, I layered both tights and thermals underneath my jeans. The rain and wind made it extra cold! For what to wear in Paris during winter in terms of tops, I like to wear nice, classic sweaters in an ultra-warm yet travel-friendly fabric, such as merino wool or cashmere. Other fabrics can keep you warm, too. However, merino wool tends to be the best travel fabric because it’s the most functional yet it’s so lightweight and packable! I’m obsessed with these J. 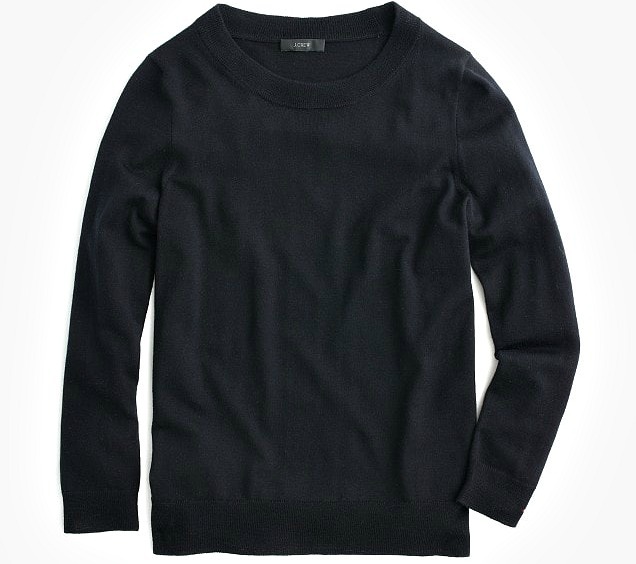 Crew merino wool sweaters because they’re light yet incredibly warm. I’ve also had one for years and it’s remained in good quality even though I’ve worn it repeatedly. Depending on how cold it is, I’d layer two to keep me warm. Since these items are on the pricey side, I stock up during sales and re-wear them over the years. Learn more about why merino wool is the best fabric for travel! Unless you’re headed to the great outdoors, jeans are ideal for winter travel because they keep your legs warm and can be worn repeatedly easily mixing and matching with all your tops. When in doubt, opt for dark denim instead of light denim. 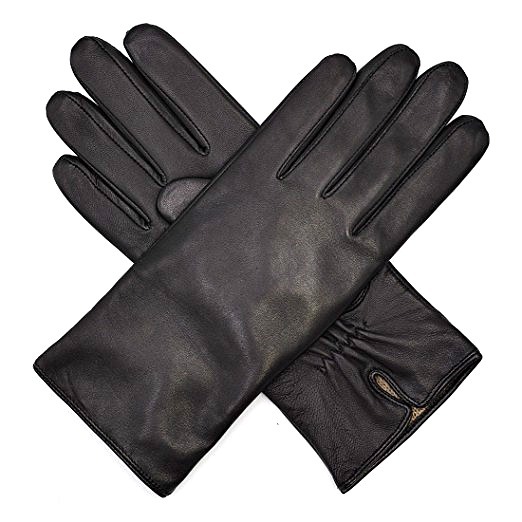 It’s classic and timeless and doesn’t go out of style, especially in the winter months. Locals mostly wore either dark blue, grey, or black jeans. Darker colors also show less dirt and you can get away with not washing them for the duration of your trip. Whether the winter or the summer, the preferred jean style is an ankle length skinny or slim jean. A good trick for a tailored look is to hem your pants so they fit your legs and don’t have excessive fabric bunching up on the bottom. Tip: if your pants are only slightly long, roll them up until they’re ankle length! You can do this with an ankle boot so your jeans are folded until they’re at the same level as the top of your boot. When planning what to wear in Paris in winter, keep in mind that leather boots are an absolute must. For the most part, locals wore ankle boots but you might want to bring taller boots like these if the temperature drops below 35 F / 0C. To be on the safe side, choose boots that specifically state that they are waterproof. Unless you’re headed to the snow, skip the snow boots and hiking shoes and opt for regular boots with waterproof features like these instead. Leather (or faux leather) boots can also be waterproof but look for ones with a rubber sole so they help you avoid slipping. You can use a waterproof spray for extra protection. Take a look at the waterproof leather boots most recommended by the readers! I saw many travelers with knit sneakers, which made for a wet and soggy day. 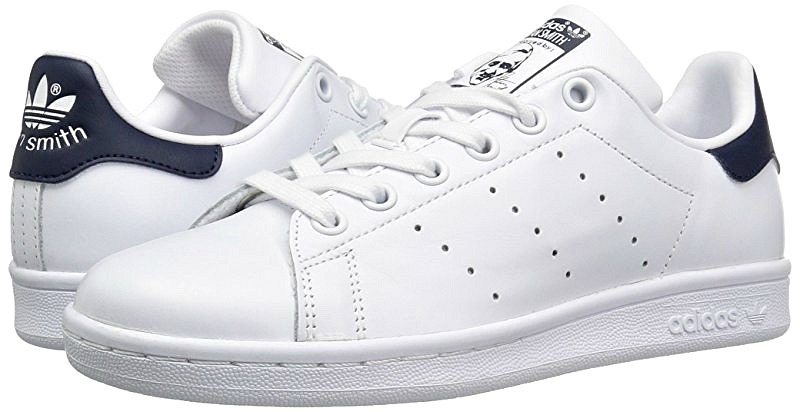 Black or white leather sneakers, such as Adidas Stan Smiths, were more commonly seen on locals. However, I still think comfortable waterproof boots are the best because they keep water from soaking your feet and help insulate warmth. Boots win over sneakers for us because they offer more warmth covering your ankles and allow you to discreetly wear layers and high socks underneath your jeans. They’re also more likely to keep your feet dry preventing rain from sliding inside your shoes unlike sneakers. These are the best white sneakers for travel! Many women feel comfortable using an anti-theft travel purse when traveling to Paris while others bring their normal bag from home. Regardless of what type of purse you choose it’s important to follow a few practical things such as leaving your passport locked in your accommodation while sightseeing and distributing your cash and cards. A crossbody purse is a fantastic way to carry all of your belongings when exploring a city like Paris in winter. Choose a bag that’s big enough to carry things like an umbrella and water bottle. While an anti-theft bag may be helpful it’s not necessary. As you choose what to wear in Paris in winter, opt for a purse that doesn’t scream “tourist” as handbag theft is common in busy tourist areas. The benefit of having a crossbody is that you can keep it securely around your body, not hung loosely on your shoulder. Make sure to keep hold of it and wear it towards the front of your body not behind you. 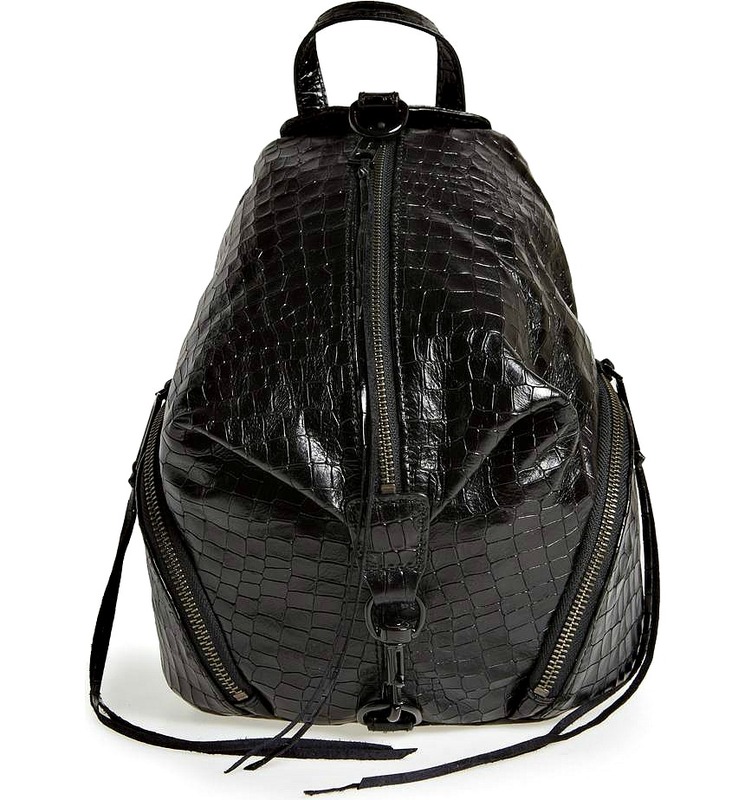 I like to use my roomy yet stylish Rebecca Minkoff Julian Backpack (the regular size) instead of a crossbody. I secure it by locking the flap upwards instead of down. I was also happy to have my Julian because it’s leather and water-resistant. In addition, I also use the anti-theft accessories listed below. Pickpockets are one of the biggest issues tourists face when traveling to Paris or other major cities around the world. Follow the tips in this post on protecting your valuables while traveling and use certain anti-theft accessories to protect yourself from petty theft. While travelers want to blend in as much as possible, remember to prioritize comfort over impractical clothing. It’s important to try to strike a balance with functional fashion, especially in the winter time when staying warm is crucial. However, if you’d like to adapt your wardrobe ever so slightly for your European travels, a simple update is to choose dark denim instead of light blue washes. Also, leave your eye shadows, contour kits, and curling irons at home. The key is casual hair, minimal but polished makeup, and not over-accessorizing. What are your tips on what to wear in Paris in winter? Share your outfit ideas in the comments below! Hope you liked this post on what to wear in Paris in winter. Please share it with your friends on Facebook, Twitter and Pinterest. Thanks for reading! We go to Paris every February (my birthday) since 2015 for two weeks. I’ve learn my lesson well. I over packed the first two years. My suggestion is as follows. First check the weather pattern a month before ur trip. Bring 2 coats. One heavy (my MK long puffy coat) and one light (cashmere/wool) mid leg length. Lots of thermal underwear (long sleeve & short sleeve thermal, thermal pants to layer ur jeans/pants) knee length boots & thick soled sneakers. Wool socks. 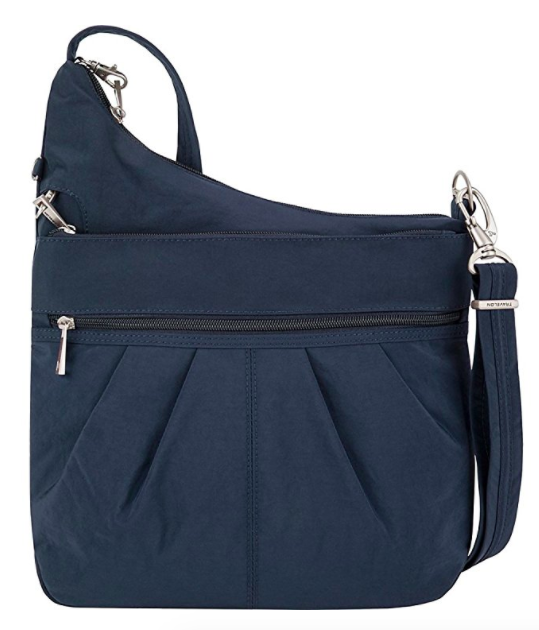 Baggalini has a great choice of inexpensive waterproof cross body bags with lots of pockets. Cashmere or wool sweaters. 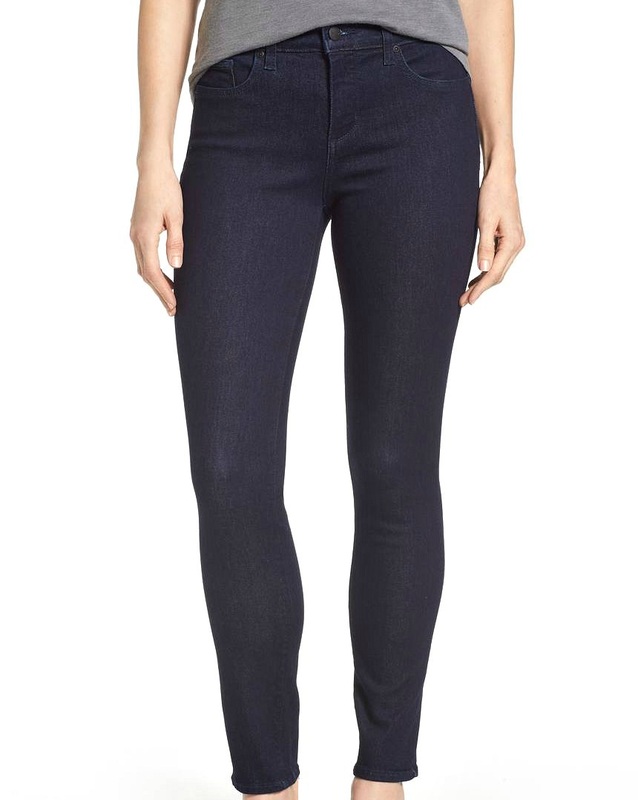 Stretchy pants/jeans (they’re comfortable even with a thick thermal under it). Comfortable undies & bra😊. Long scarfs (1 or 2) that’s long enough-you can wrap it over ur head if it gets really, really cold & it does most esp at nite coming back from all ur outings/dinner. Gloves optional as you can put ur hands inside ur coat pockets. Oh & lots of soft lip balm. Thanks for this article. I look forward to visiting Paris next year during the colder months. Any help will do! soft, warm scarf: something I could leave on even when inside, if I’m sitting next to a draft or in a cool-ish room, i.e., in some restaurants and shops. That way I can keep warm without keeping my coat on. Keep in mind that sidewalk café tables are usually enclosed in glass for the winter (one of my favorite aspects of Paris in winter); there is coat check in the museums (so you can dress for the outside, but don’t have to drag it around while taking in the great museums); and it is miserable carrying an umbrella in winter if you don’t have gloves on! Thank you for the specific tips Clariza!! These are great additions!